only for Administrators group members. only if executionServiceAPI.updateVariables.enabled set to true. Note. By default (or if this setting is missing in wfe.custom.system.properties) this value set to false, and this feature is turned off. 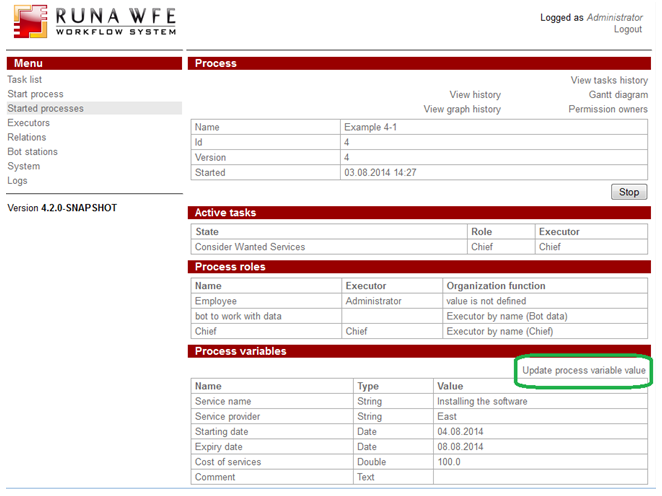 If the feature is available for current user "Update value" link is visible on business process instance page. This link leads to a page with business process variables information where current variables values can be changed. The variable can be chosen with the help of combobox. The chosen variable script name and the current value are displayed in the table. To enter new variable value use cell in "New value" row. It's also possible to set new value to NULL. Use corresponding checkbox to do so. After entering new value (or setting it to NULL), click "Update variable value" button. 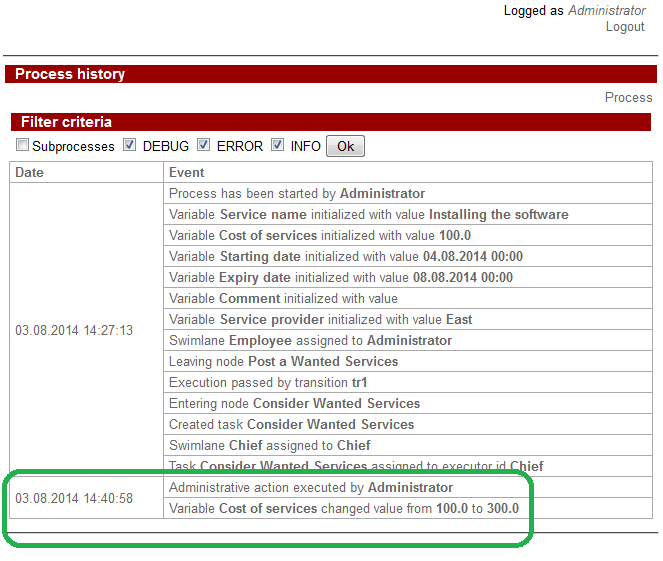 All events of variables values updates are logged in business process instance history. In this log you can see when and by whom variable value was changed as well as old and new variable values. This feature is very useful during complicated business process development. It allows the Administrator to change "wrong" values without stopping and restarting the process instance and to see if the process works as expected. This page was last modified on 7 January 2017, at 16:50.